Chair yoga for seniors is a popular option for people unable to balance while standing and those with limited mobility such as the wheelchair-bound. Chair yoga for seniors avoids having to get up and down off the floor, is gentle for arthritis, and is tolerated by those with high blood pressure. Importantly, a senior who has up until now led a sedentary lifestyle should discuss starting chair yoga with their doctor first. If they are not familiar with the process, describe chair yoga and what it would entail. Assuming that the doctor approves, the senior can get started. The next step after checking with the doctor is to look for classes at the local community or senior center, gym, yoga studio, parks and recreation department, or hospital. 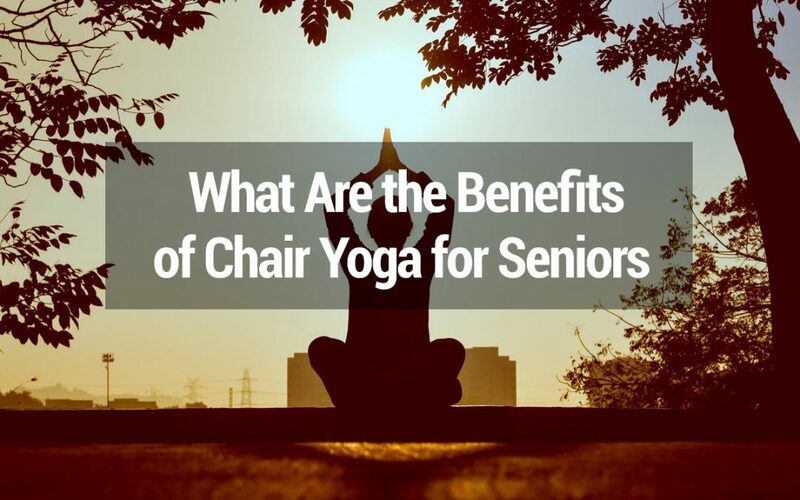 After confirming the location of the nearest chair yoga for seniors, the senior should be sure to bring their yoga mat–they’ll still need it on the floor. The senior should check first whether the teacher provides the chairs, and what the room temperature will be so they will know how to dress. 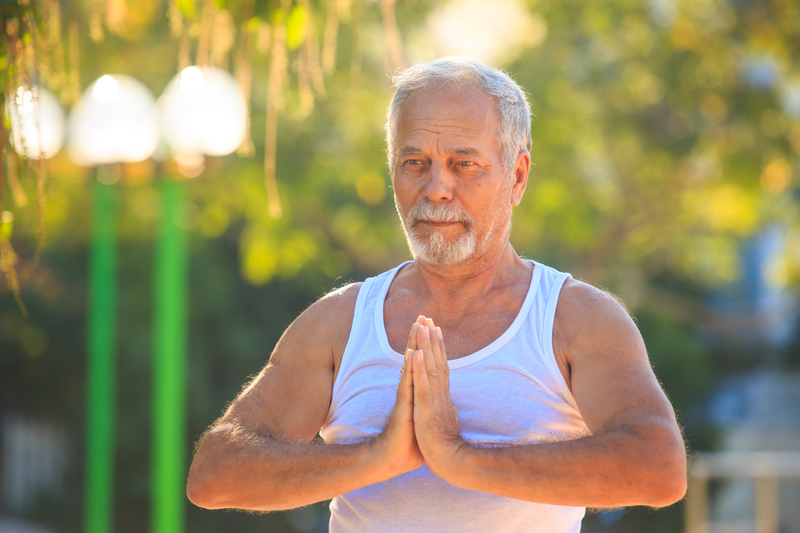 Why Should Seniors Do Yoga? Chair yoga was invented by Lakshmi Voelker-Binder in 1982 when one of her 30-something students became affected by arthritis and could no longer get up and down from the floor to practice traditional yoga. It has since spread all over the world: chair yoga for seniors is one of the most practiced forms of chair yoga. Chair yoga is a modified form of yoga that is still a great workout for anyone, especially yoga beginners. The workout is concentrated in the arms and shoulders, and it will have participants trying poses they’re probably not accustomed to. It is performed while sitting in or holding on to a chair, so it’s great for a short workout at the office for all ages. Some well-known poses in chair yoga for seniors and its many other practitioners include the tree, the stick, the dancer, and the eagle, each of which builds muscle strength and confidence. The poses also reconnect the body and the mind and help those who struggle with depression. Baby boomers, the latest wave of seniors, often look for trendy new activities to stay fit. Chair yoga for seniors is definitely for them: it is both fun and challenging. Chair yoga for seniors is an accessible path to wellness. Chair yoga is an adaptive fitness and exercise program for those who can’t try traditional methods of physical activity due to age or a limiting physical condition. Many seniors fit in one of these two categories. As seniors age and traditionally become more sedentary, they often find fewer and fewer ways to keep their bodies, minds, and spirits healthy and vital. Falls are the leading cause of injury-related fatalities for seniors, and they can cause many other serious and disability-causing injuries, such as head trauma and fractures. By improving strength and flexibility, chair yoga for seniors can help seniors avoid falls. Seniors with disabilities, weight challenges, inflexibility, or a lack of floor to standing mobility who cannot practice traditional yoga may benefit from frequent chair yoga for seniors, whether at home, at a class, or at the office. Even a wheelchair-bound senior can receive chair yoga’s benefits, such as mind-body-spirit integration that will keep them going strong. The main benefits of chair yoga for seniors include improved flexibility, better concentration, increased strength, reduced joint strain, and convenience/portability. If practiced weekly, chair yoga for seniors can lead to better sleep and less chronic constipation without using medication. Chronic pain from arthritis, sciatica, and chronic back pain can be greatly reduced. Chair yoga for seniors especially benefits those suffering from obesity, osteoporosis and osteopenia, arthritis, diabetes, heart disease, chronic pain, lung problems, disabled people, multiple sclerosis, scoliosis, and mental health challenges. For weight control, many regular exercises are not possible until there is some weight loss. During that time of transition, chair yoga for seniors is a perfect exercise that helps them stay fit and flexible. Up to 65 percent of American adults are overweight, and of that group, 30 percent are obese. Usually, long-term changes in lifestyle, such as gentle exercise (e.g., practicing chair yoga), along with making changes in diet, are what will help them manage the condition. Chair yoga raises their metabolic rate when they are increasing their muscle tissue and is a stress reliever (which reduces comfort eating). Reducing exercise, especially when seniors grow older, can lead to osteopenia or low bone mass, a precursor to osteoporosis, which makes their bones more fragile. Chair yoga for seniors has been shown to slow, and sometimes even reverse both conditions. In addition, they would want to avoid forward bending/trunk contracting chair yoga poses. Osteoporosis is very common, especially among seniors, affecting 44 million Americans: one out of two women and one out of eight men in their lifetime. Fortunately, osteoporosis is treatable and may be preventable. Seniors with multiple sclerosis (MS) can also benefit from chair yoga. Surveys suggest that people with MS have used yoga most frequently to treat stiffness, to help relax, and to improve balance. A study looked at the effect of yoga and traditional aerobic exercise on cognitive function, fatigue, and mood in participants assigned to conventional exercise, yoga, or nothing. After six months, both those who did yoga and conventional exercise showed decreased fatigue.Seniors with mental illness, especially depression, will benefit from chair yoga. Chair yoga for seniors is a way to exercise and to move slowly into a state of inner peace by using the breathing techniques, meditation, and relaxation poses. Arthritis can cause pain, stiffness, and joint swelling, making it difficult for seniors to move normally and do what they have to. Weekly chair yoga for seniors can increase their strength and confidence to better manage their arthritis and can reduce their pain and stiffness. For diabetes patients, who are among the 7 percent of the American population, daily chair yoga for 40 minutes showed a decrease in their fasting blood sugar levels. Lung capacity improved 10 percent, and Type 2 diabetics can have better blood sugar control. Heart disease and strokes are common cardiovascular diseases. High blood pressure, high LDL cholesterol, and smoking are key heart disease risk factors for heart disease. About half of Americans have at least one of these three risk factors. One hour of chair yoga daily for 3 months can decrease the blood pressure as well as blood sugar, cholesterol, and triglycerides. Researchers found that just four weeks of regular yoga sessions significantly reduced the frequency and severity of chronic pain. But many people with severe back pain cannot do traditional yoga, so chair yoga is their main way to benefit from yoga. Breathing problems can be worked on by yoga’s breathing technique called pranayama. Pranayama maximizes the capacity of the lungs. Chair yoga for seniors will address pranayama breathing. 30 minutes of chair yoga also relaxes the neck and improves posture. Chair yoga for seniors also builds confidence with those with disabilities both mild and severe, increasing enjoyment. 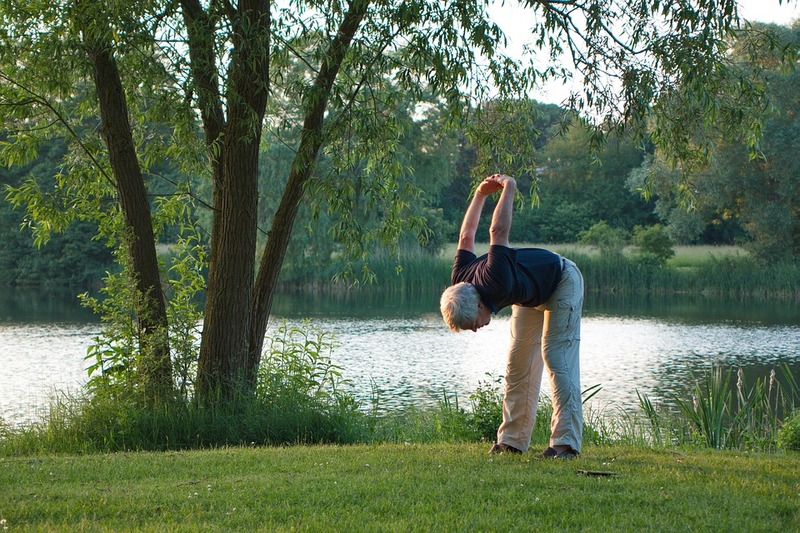 Seniors with multiple sclerosis (MS) can also benefit from chair yoga. Surveys suggest that people with MS have used yoga most frequently to treat stiffness, to help relax, and to improve balance. A study looked at the effect of yoga and traditional aerobic exercise on cognitive function, fatigue, and mood in participants assigned to conventional exercise, yoga, or nothing. After six months, both those who did yoga and conventional exercise showed decreased fatigue. Seniors with mental illness, especially depression, will benefit from chair yoga. Chair yoga for seniors is a way to exercise and to move slowly into a state of inner peace by using the breathing techniques, meditation, and relaxation poses. Chair yoga was invented by Lakshmi Voelker-Binder in 1982 when one of her regular yoga students was limited in her mobility by arthritis. Many seniors struggle with mobility and balance, so chair yoga is a good option for them. Also, chair yoga avoids having to get up and down off the floor, is gentle for arthritis, and is tolerated with those with high blood pressure. After checking with their doctor first to make sure chair yoga is appropriate for them, seniors can find chair yoga classes at their local community or senior center, gym, yoga studio, parks and recreation department, or hospital, or they can purchase Voelker-Binder’s video and practice it at home. Chair yoga requires a mat and a chair. Chair yoga is a modified form of yoga, and it is accessible to yoga beginners. The workout is concentrated in the arms and shoulders and may include unfamiliar poses at first. It is performed while sitting in or holding on to a chair, so it’s great for a short work out at the office for all ages. Some well-known poses in chair yoga include the tree, the stick, the dancer, and the eagle, each of which builds muscle strength and confidence. Reconnecting bodies with minds, the poses also help those who struggle with depression and other mental illnesses. Chair yoga for seniors is a hip way for cool baby boomers to stay fit as they age. Chair yoga for seniors helps address another one of their areas of concern: falling. If seniors increase their strength and flexibility, they may avoid falls and live longer. Chair yoga for senior’s main benefits are improved flexibility, better concentration, increased strength, reduced joint strain, and convenience/portability. Chair yoga for seniors can also help with weight control, osteopenia and osteoporosis, arthritis, diabetes, cardiovascular disease, chronic pain, breathing problems, multiple sclerosis, mental illness/depression, and can help build confidence for those with limiting disabilities.